America's biggest movie theater company is bringing the silver screen to Saudi Arabia. AMC (AMC) said Wednesday it has scored the first cinema operating license granted by the Saudi Ministry of Culture following the country's move in December to end a 35-year ban on movie theaters. The US chain signed an agreement with a Saudi government subsidiary to jointly open at least 30 cinemas across the kingdom in the next five years, according to a company statement. 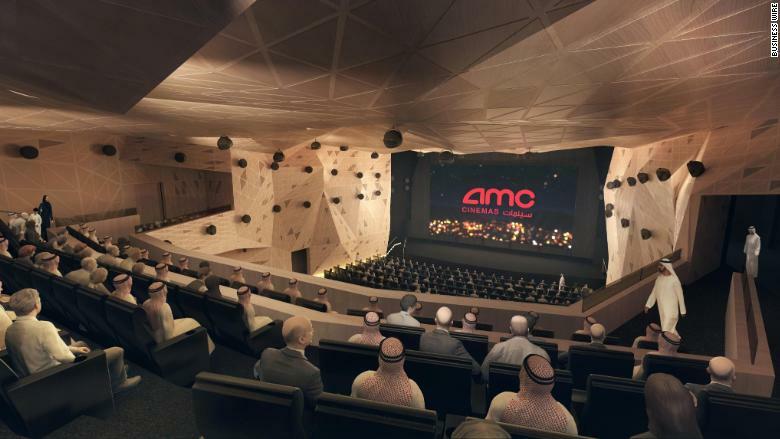 The first AMC movie theater will open in Riyadh, the Saudi capital, on April 18. AMC, which is owned by Chinese property and entertainment conglomerate Dalian Wanda Group, is likely to end up competing with regional cinema operators for Saudi theater goers. An artist's rendering of AMC's first movie theater in Riyadh, Saudi Arabia. Vox Cinemas and Novo Cinemas, both based in the United Arab Emirates, are interested in expanding across the border into the new, potentially much bigger, Saudi market. The UAE chains already cater to the region by subtitling movies in Arabic and removing scenes of a sexual nature. Saudi Arabia is undergoing an economic overhaul under Vision 2030 -- a blueprint for diversifying the economy over the next decade and reducing the country's reliance on oil. The government is investing billions in the entertainment sector, hoping it will act as a catalyst for economic growth, create new employment and investment opportunities, and provide Saudis with a wider range of entertainment options. 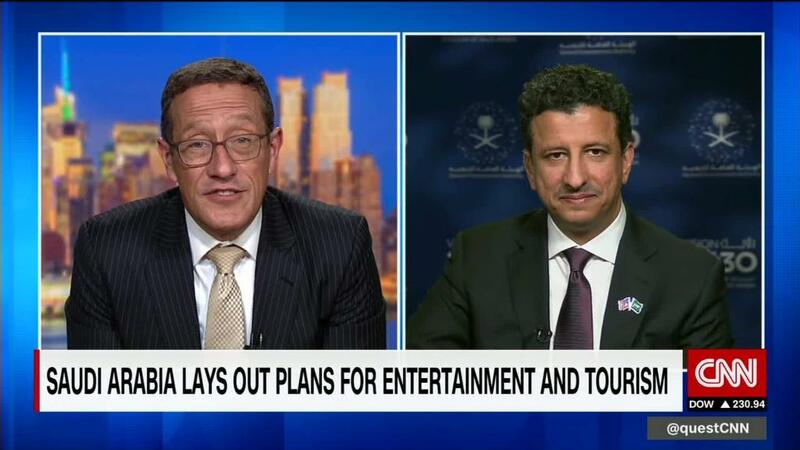 The Saudi government wants its citizens to spend more on entertainment and tourism inside the country, Ahmed Al Khateeb, chairman of Saudi Arabia's General Entertainment Authority, said in an interview with CNNMoney's Richard Quest on Wednesday. Saudis have in the past traveled abroad to get their entertainment fix because of all the restrictions in the deeply conservative country. Al Khateeb said Saudis spend roughly $20 billion a year overseas on entertainment and tourism. The country is gradually relaxing social and cultural restrictions as it tries to return to what Crown Prince Mohammed bin Salman has called "a more moderate Islam." The majority of Saudis are supportive of social reforms, Al Khateeb said, noting that some 70% of the kingdom's population is under 30 years old. Besides cinema openings, Cirque du Soleil will come to Riyadh this year and the city of Jeddah hosted the kingdom's first-ever Comi-Con in February, he said. WWE is also holding a Royal Rumble wrestling event in Jeddah this month, featuring wrestler and actor John Cena. -- Zahraa Alkhalisi contributed to this story.